Here is a post at TED-Ed: Lessons Worth Learning by Emilie Soffe in which she interviews Evan Deutsch and Jon Portman. They discuss their animated account of Einstein’s life and work in a single year, 1905. To read the complete interview and see the video, check out other resources, and learn more about TED, please click here. 1905 was a big year for Albert Einstein. He was 26 years old and working in the Swiss Patent Office when, in the span of seven months, he published four papers that would eventually be hugely influential. 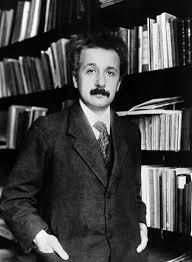 In these papers, he proposed that light could be a particle, proved that atoms existed, laid out his theory of special relativity and offered up his signature equation E=MC2. When TED-Ed decided to create a lesson on this year in Einstein’s life, they were shocked when animators Oxbow Creative submitted their final animation and the file was under 1GB in size. Usually, these files are huge, more like 4 or 5GB. But any fears that the small package wouldn’t pack a huge punch were quashed when they saw the final product: the lesson is clever, swift and striking. Oxbow Creative opted for a beautiful, minimalist style for the lesson — which allowed for a level of precision they hope would make Einstein proud. We caught up with Oxbow Creative’s Evan Deutsch and Jon Portman to find out more. The animation is beautiful. Tell us more about the minimalist style. Jon Portman: Einstein was, by all accounts, a jovial character and a bit of a troublemaker, so we wanted to keep the illustrative style light and fun. We also chose a minimalist visual program with a very controlled, tricolor palette, keeping most of the action small and center-screen. The four theories discussed in the story have had a massive influence on our understanding of the universe, and yet they came from inside the head of this odd little German fellow who reviewed patent applications for a living. This disproportion was what inspired us to portray Einstein as a brave little character in a world too big for him. Quite fittingly, once he gets his deserved recognition in the final sequence, the scale snaps back in the opposite direction and our solar system is revealed to be Einstein-centric after all. How long did the animation take? Evan Deutsch: Start to finish, this project took us about 7-8 weeks. Internally, we went through several rounds of illustration and storyboarding until we felt we really captured the dichotomy of Einstein’s quirky, whimsical character and his world-changing discoveries. We also went through several rounds of feedback with [TED–Ed Educator] Larry [Lagerstrom] to ensure that all the details were accurate from a scientific perspective. Having the academic support of Larry and the creative feedback from TED-Ed made for a really stimulating and efficient process. The music for the piece is also great. How did you pick it? JP: We knew we wanted something classical, to echo the elegance of Einstein’s theorems. We happened upon this beautiful little arrangement by Debbie Miller and Gavin Keese. We were super psyched when we first heard it; its energy and tone just felt right for the story, and it has this great almost gypsy-like feel to it. We consider the musical accompaniment to be just as important as the animation itself, so we try to find the right track early on and let it inform the visual process. Did you get to choose the subject for the lesson, or was it chosen for you? JP: TED-Ed is really great about giving the animators choice on the subjects they feel passionately about. I took quite a few physics classes while at school — I was one credit away from a minor, much to my chagrin — and have always been fascinated by how the universe behaves. When I mentioned this to the TED-Ed folks, they handed us the Einstein script. We jumped at the chance to bring his story to the screen. Here is a direct link to the complete interview and animated film. Emilie Soffe is an Editorial Coordinator. To learn more about TED-Ed, please click here.